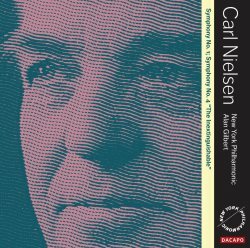 This is the second volume in Alan Gilbert’s Nielsen cycle, recorded live in New York. I bought the previous volume in the series, which covered the Second and Third Symphonies on the back of Dan Morgan’s enthusiastic download review. Having been impressed by that release I was keen to hear this second instalment, and all the more so after sampling it in the MusicWeb Listening Studio. I was particularly keen to hear Gilbert in the Fourth Symphony because this is my favourite among the six. It was written against a troubled background of both the First World War and turbulence in Nielsen’s domestic life but, although those things inevitably cast a shadow, what I find so attractive about this symphony is its unquenchable spirit. So, though the first movement bursts upon us with white-hot energy it’s not long before a more lyrical idea appears in the woodwind and this theme will be of crucial importance, not just in this movement but also in bringing the symphony home some thirty minutes later. Right from the start the sound of the orchestra is very powerful. In part this is the actual, full-on sound that the orchestra makes but I think it’s accentuated by the recording itself. The sound has enormous impact and presence. This means that an abundance of detail is reported. However, it also means that the loud passages come across very strongly indeed. At first I was very impressed by the power of the climaxes but as the performance progressed I began to wonder if sometimes it was, perhaps, a little too much of a good thing. Overall, though, I admired the spirited performance. The transition to the second of the four linked movement is well managed and in this Poco allegretto the New York woodwinds display no little finesse in the way they play. Their colleagues in the string section launch the slow movement with tremendous intensity. This intensity is sustained and, indeed, it increases as a very taut and powerful performance of the movement unfolds. The main climax is pretty overpowering but highly impressive. Ushered in by rushing strings the finale erupts. The music is highly charged and Gilbert and his players don’t short-change their listeners. The duel of the timpani is very exciting indeed, the drums spectacularly ‘present’. Though the music may seem hard driven to some listeners I felt that it just about stays on the right side and Nielsen‘s magnificent final peroration comes over very well. Although I was impressed by this New York performance I couldn’t escape a nagging doubt at the back of my mind. I looked out Osmo Vänskä’s 2001 recording for BIS with the BBC Scottish Symphony Orchestra (review). Two things struck me; one immediately, one after listening for a little while. The immediate difference lies in the recorded sound. The BIS recording, which is on CD not SACD, was made in the City Halls, Glasgow and under studio conditions, I think. The orchestra is less closely recorded and while their sound doesn’t have as much impact as that of the NYPO it still registers extremely well. Crucially, there’s space around the orchestra and this gives a much more pleasing impression. By comparison there’s a danger that the New York performance appears slightly aggressive. That brings me to the second thing that struck me, something which is much more subjective. I have the sense that Vänskä is rather more successful than Alan Gilbert in putting across the humanity of Nielsen. As I say, this is a subjective point and other listeners may not feel the same. This is not to diminish the achievement of the Gilbert performance but rather to state the obvious point that there’s more than one way of looking at a piece. Jens Cornelius reminds us in his useful booklet note for Dacapo that when he came to write his First Symphony Nielsen had only a handful of orchestral works to his credit, all of them small scale. Notwithstanding this, the First represents an astonishingly auspicious and confident debut as a symphonist. Cornelius emphasises that Nielsen sought to avoid convention and I love the way he describes the opening: ‘Instead we meet a strapping fellow who expresses himself in short phrases and with powerful breaths.’ I’m sure he’s right to say that the resulting music reflects a combination of Nielsen’s wish to avoid being fettered by convention and his lack at that time of a fully-developed technique. ‘Thank goodness’ is all I can say. Instead Nielsen gives the impression of a confident man who wants to take on the world, though not in an aggressive fashion. Notwithstanding that, this movement is not all about unbridled energy; there are also some lovely lyrical passages. In the second movement we hear the lyrical side of Nielsen come even more to the fore. This is big-hearted music and Gilbert and the NYPO do it well. I also enjoyed much of their account of the genial and likeable Allegro comodo though I do wonder if the louder passages are perhaps a bit too fierce. The finale is energetic and optimistic and this New York performance has thrust and brio. I enjoyed this reading of the First Symphony though once again Vänskä’s recording, made in 2000, shows the benefits of a somewhat more distanced and, dare I say, nuanced recording (review). There’s a good deal to admire in these performances, even if there are other, perhaps more persuasive ways to play Nielsen. Dacapo’s superbly defined SACD sound is most impressive though some may find it a bit full-on. I look forward to hearing Alan Gilbert in the mighty Fifth.